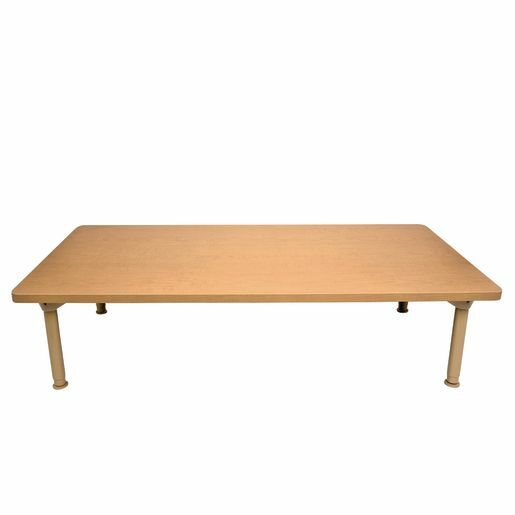 Excellent quality 30" x 60" rectangular table. Top is a warm, neutral color with a subtle maple woodgrain pattern. Laminate surface is durable, non-warping, easy to clean and disinfect with bleach solution, and highly resistant to stains, scratches, and impact damage. Heavy-duty leg brackets attach directly underneath top for super stability and simple assembly. Extra design benefit: no table apron to get in the way of children's knees! Seats up to eight.